Uncut magazine, trademarked as UNCUT, is a monthly publication based in London. It is available across the English-speaking world, and focuses on music, but also includes film and books sections. A DVD magazine under the Uncut brand was published quarterly from 2005 to 2006. Uncut was launched in May 1997 as "a monthly magazine aimed at 25- to 45-year-old men that focuses on music and movies", edited by Allan Jones (former editor of Melody Maker). Jones has stated that "[t]he idea for Uncut came from my own disenchantment about what I was doing with Melody Maker. There was a publishing initiative to make the audience younger; I was getting older and they wanted to take the readers further away from me", specifically referring to the then dominant Britpop genre. According to IPC Media, 86% of the magazine's readers are male and their average age is 37 years. Uncut's contents include lengthy features on old albums, interviews with film directors, music and film news, and reviews of all major new album, film and DVD releases. Its music features tend to focus on genres such as Americana, rock and alternative country. Each month the magazine includes a free CD, which may include both new and older music. Special Issues have covered U2, Radiohead, Bob Dylan, Bruce Springsteen, The Byrds, David Bowie, Demon Records, Eric Clapton, John Lennon, Pink Floyd, Queen, Martin Scorsese, Motown Records, Morrissey, George Harrison, Jimmy Page, Led Zeppelin, The Beach Boys, Paul McCartney, Neil Young, The Beatles, Elvis Costello, The Kinks, Fleetwood Mac and more. Uncut underwent a radical redesign in May 2006, as a result of which the magazine no longer catered for books and reduced its film content. Allan Jones writes a regular monthly column, recounting stories from his long career in music journalism. Uncut's monthly circulation has dropped from over 90,000 in 2007 to 47,890 in the second half of 2015. Uncut often produces themed spin-off titles celebrating the career of one artist. This series has been known as Uncut Legends. Artists who have so far had magazines entirely devoted to them include Radiohead, Kurt Cobain, U2, Bruce Springsteen and John Lennon. The Lennon magazine was produced to commemorate the 25th anniversary of the death of the former Beatle. The majority of these titles have been produced by magazine editor Chris Hunt. The series started in 2003 with an inaugural issue devoted to Bob Dylan, edited by Nigel Williamson. 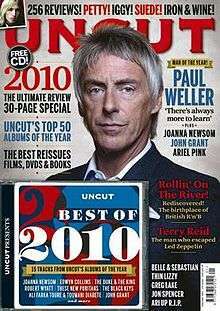 In 2008 Uncut launched their inaugural Uncut Music Award, which is described as "a quest to find the most inspiring and rewarding musical experience of the past 12 months." A list of 25 nominees is selected by a panel of 10 judges, who are all musicians or music industry professionals, and they come together to decide a winner. Past winners have included Fleet Foxes (2008), Tinariwen (2009), Paul Weller (2010) and P.J. Harvey (2011). In late 2005, Allan Jones and publishing director Andrew Sumner launched a spin-off of the main movies and music magazine, that focused its attention on DVD releases of classic movies. Billed as "the only great movie magazine," Uncut DVD was designed to compete with such established titles as Ultimate DVD, DVD Review and DVD Monthly. Despite strong reviews in the UK trade press, Uncut DVD folded after three quarterly issues. 1 2 "ABC Certificates and Reports: Uncut". Audit Bureau of Circulations. Retrieved 2 May 2016. 1 2 3 "If you ask me: Allan Jones". Press Gazette. October 1, 2007. Retrieved 2010-02-15. ↑ LENNON. uncut.co.uk. Retrieved on 4 October 2007.